Today everyone has a Smartphone. This means that you carry your music with you wherever you go. Often, you use headphones to enjoy music personally or perhaps you want to share it with your friends or family members. For the latter, you have the Bluetooth speakers. Bluetooth speakers seamlessly connect to different devices, tablets, or Smartphones without the need for additional wires. These are portable, so you can take them with you to the beach or the park where you can listen to your favorite songs in a group so that everyone can enjoy. 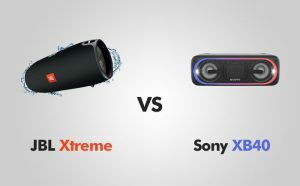 Two popular Bluetooth portable speakers are JBL Xtreme and Sony XB40. Below is a review of these two products. It offers Bluetooth wireless streaming features. This speaker connects the maximum of 3 tablets or Smartphones to the speaker. It takes turns to play powerful stereo sound. Bluetooth audio of Sony XB40, LDAC transmits 3x additional data at 990 kbps maximum rate of transfer. This is in comparison to the traditional Bluetooth audio capacity. This speaker gives users a superior listening experience through wireless technology. It packs a massive rechargeable Li-ion 10,000 mAh battery that supports up to 15 hours of playtime. Use the USB dual ports to charge this device. So, you can quickly charge the battery for an endless play. This speaker has an effective splash proof capacity. This means that you do not need to worry about spills or rain. Clean the speakers using tap water. Take care not to submerge this in water though. Use running water for cleaning. This also has great water resistance property. This speaker has IPX5 water-resistant capability, so you can simply relax whether you are using this speaker outdoors or indoors. It has a bass radiator. You can see, hear, and feel bass, the speakers are so powerful. External dual passive radiators prove this for you. This has a powerful sound output. The highly powerful sound and extra bass allows you to lift roof with your favorite music as you enjoy your time indoors or outdoors. Take your music with you and for that extra punch, you can hit the EXTRA BASS button. It has passive dual radiators working together along with full-range speakers numbering two. This enhances the low-end tones, offering a boost to the bass. Manufactured by America’s eminent loudspeaker manufacturers, JBL Xtreme offers its users a powerful sound with transportable features. Lifestyle material: The speaker will endure all the adventures that you may have in mind with its rugged rubber housing and durable fabric material. Integration of voice assistant: Access Google Now or Siri from the speaker using simple press button functions. JBL Connect: You can build a personal ecosystem through the connection of multiple Connect speakers to amplify your listening experience. Bass Radiator: You can see, hear, and feel bass, the speakers are that powerful. External dual passive radiators prove it for you. It includes two visible Bass radiators and active transducers numbering to four. This powerful pair of portable speakers delivers earth-shaking stereo sound. It packs a rechargeable massive Li-ion 10,000 mAh battery that supports up to 15 hours of non-stop playtime with USB dual charge out. With splash-proof fabric design, noise-canceling and echo features, you can take conference calls with greater voice clarity on its speakerphone. This product has a touch of button functionality for taking calls using the speaker. Manufactured by Japanese Multi-national Corporation, Sony XB40 has a built-in Bluetooth speaker that allows users to create their very personal club night with friends, easily. Powerful sound: This product offers superior listening quality with an extra bass that allows you to lift roof with your favorite music as you enjoy your time indoors or outdoors. Take your music with you and for that extra punch, you can hit the EXTRA BASS button. It has passive dual radiators working together with full-range speakers numbering two. This enhances the low-end tones, offering a boost to the bass. Flashy lights: Now you can both hear and see the music beats with multi-colored built-in line light, flashing strobe, and speaker lights. Water resistance: This speaker has IPX5 water-resistant feature, so you can simply relax with your favorite beverage while listening to your favorite songs, whether outdoors or indoors – your music player will be safe! Party Chain Wireless: This feature allows you to listen to the same song and can connect a maximum 10 speakers wirelessly with Bluetooth technology. You can also synchronize both lights and music. This way everyone can dance to the beats. Wide stereo sound: You can add extra wireless speakers to enjoy a room-filling sound. Music Centre: The Music Centre from Sony offers easy controls. Here you can manage music the easy and quick way using the Smartphone. All you need to do is to install an app for controlling lights, music, and more. Bluetooth audio: LDAC can transmit three times additional data at 990 kbps maximum rate of transfer. This is in comparison to the traditional Bluetooth audio capacities. This speaker gives users a superior listening experience through wireless technology. USB connections: connect the Smartphone with USB to charge the battery. Multi-device connections: This speaker can connect maximum three devices. It takes turns for playing the favorite tunes of the users. One-touch listening: Get your favorite beats going with a simple touch of NFC-enabled Smartphone with the speaker. PROS: Powerful Li-ion battery / Great sound / Can sync with multiple devices / Can be used as a power bank / Splash-proof. PROS: Well-designed lights system / No distortion of extra bass / Splash-proof. CONS: Heavy / Not waterproof. CONS: No Micro-USB charging / Proprietary charger / Poor speakerphone. Those looking for something more durable with flare but in a smaller size and powerful battery life would love Sony XB40. If you prefer high volume and good sound quality, JBL Xtreme gives you a better choice, especially if you want to play music outdoors.